So as not to bury the lede, I’ll just let you know that this story ends with me completely enamored with the Rdio service and the music it brings into my life. But it wasn’t a sure thing … Give a listen to this playlist while you read on! As someone whose aesthetic is devoted to an instrument founded in technology that was around before the Caesars — i.e., levers, valves, and bellows — it should surprise no one that I am rarely an early adopter of, to use a technical term, the “newly fangled.” I had to be counseled through the great CD conversion of the 1980s, and just five years ago, MP3s seemed like so much ephemeral cods-wattle to me. I go through a process, I’ll admit. It resembles grief, in that there are stages. (ANGER: “F*&^ing music industry wants us to buy our music AGAIN in another format! I don’t think so!” DEPRESSION: “Oh, my beloved record collection … *sob* … vinyl … *weep* … beautiful covers … *salty tears* … wasted …”) But when I reach acceptance, I reach it completely, wondering how I had ever doubted in the first place. This is usually when my wife steps in and somehow signals that it’s time for me to get a grip already. It was my wife, for example, who bought me my first iPod, thus bringing my doctrinaire objections about the value of artifacts and “the authentic listening experience” to a deserved end. Now that was cods-wattle. 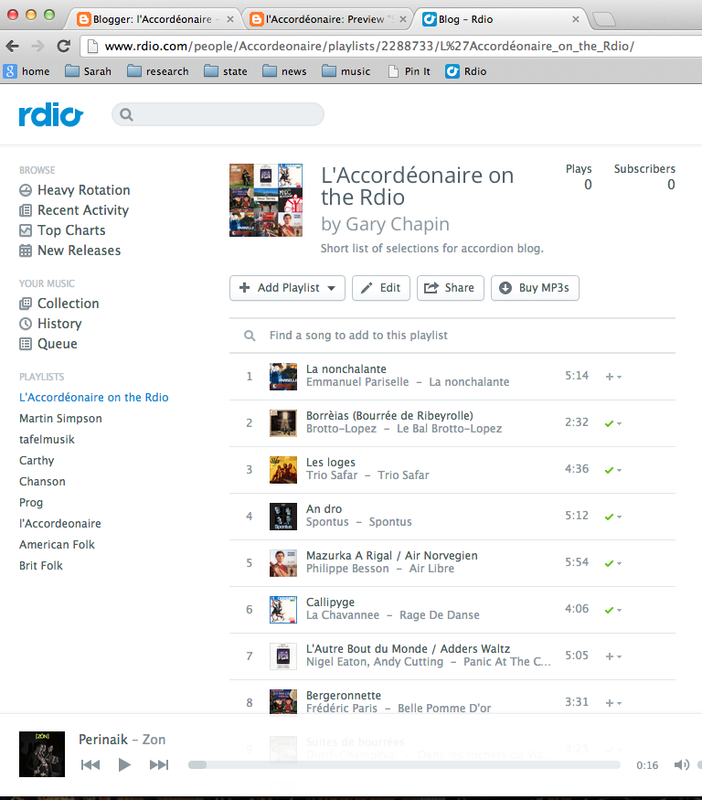 So, in January my wife bought me a subscription to Rdio, a commercial music streaming service. Not something I had considered before. I had heard of Spotify and other such streaming services, of course, but I always asked myself, as Neil Postman suggests we do, “What is the problem for which this technology is the answer?” I could think of none. Subscribe to Spotify? Why would I do such a thing? You want me to pay for music that I wouldn’t then own??? What kind of IDIOT would do that??? What? At that point, I had never heard of Rdio (which, I later discovered, is pronounced in the pirate manner, “Ar-Dee-Oh”). Then I got the text from my wife, “I just subscribed you to Rdio …” My wife, as I have mentioned in the past, is a woman of marvelous virtue. She knows me, and she knows things. If she thought I should check out Rdio … hm. What fresh new Hell is this? Ah … Wondrous! In many genres, I have discovered, Rdio (and Spotify) present one with an unimaginable cornucopia of music. It’s stunning, and the price ($14.95 USD) is astounding when you consider the ridiculous availability, and the fact that suddenly, your shelves of CDs have shifted from being repositories of treasure to being sites of clutter and storage problems. One of the first artists I looked up was Red Garland, a jazz pianist who I’m particularly fond of, and immediately I found The Complete Studio Recordings. Thank you very much. I think I will. Then I started looking for Baroque music — Bach, Handel, and all that — and sweet mother of God! One could listen their whole lives without exhausting the goodness there. How about the entire Topic Records catalogue, a cornerstone of BritTrad music? Yes, they do. What about … well, you get the idea. They had a lot of music in a lot of genres. They may not have had every specific thing I went looking for, but they had enough so that at any given moment in time I could find excellent music that would scratch whatever itch I had at that moment. Extraordinary. But what about L’Accordéon? What about the tradFrench that runs through my free reed veins? Give a listen to the playlist! An abundance! Perhaps I did not discover that long lost Marc Perrone recording I’ve been looking for — the one with “En Avant Blonde” — but I did find four others. I conducted a fairly thorough search and found a couple of La Chavannée recordings, some Patrick Bouffard. I did find some material that I had never seen before. Hurdy gurdy player Philippe Besson recorded on the Parsiparia label, and there was quite a bit of goodness there. Trio Safar, a fantastic group featuring accordéonaire Christian Maes, just one of the insanely virtuosic Belgians I found at the L’autre Distribution Rdio page. Chanson was well represented, from Edith Piaf to Emmanuelle Pariselle — very helpful and timely, since I’ve just been asked to play in a chanson tribute in Lewiston! And still, surprises arise! Rather than run through the laundry list, I’ve put together a short playlist. I invite you to enjoy. It contains some new discoveries for me, but also some bog norm favorites. Patrick Bouffard’s “Valse A 5 Temps” is a staggering minute fifty-nine of music. “Nova,” from a compilation of Breton accordéonists, starts off in a suspiciously modern mode, but resolves to laride greatness. If I had included Irish accordéonists or more English players, the list would be very long. I invite you to join me on Rdio. I am not a shill. This is not a paid advert. “What,” I hear you say, “you can’t see paying for music and then not ‘owning’ it?” I would invite you to consider what the “ownership” of music means, and then have a conversation with Chief Seattle about what it means to own the land. I feel as if I’ve been given direct access to the greatest artistic achievements of mankind, and I intend to enjoy it.